You’ve been asking me for my marble cake recipe for a while, and I’m finally getting around to it! While I love to come up with my own ideas for cakes, I also love hearing your suggestions. At the end of the day, I want to make what you want to see!! On a separate note, I always thought these were called marbled cake layers. I initially titled this post marbled layer cake recipe. Of course AFTER I created my thumb nails and added text to my videos, google informed me that most people actually call them MARBLE cake layers. Womp womp! Are you team marbled or marble? There was a reason I put off sharing this marble cake recipe for so long. I was embarrassed to say that in the past, I used to just make a half batch of both my vanilla cake batter and my chocolate cake batter! It was SO much extra work!! This meant making two sets of batter, which also meant twice the time commitment, twice the dishes, twice the headache!! My vanilla and chocolate layer cake recipes are super similar. In fact the main difference is that in my chocolate cake recipe, I swap out some of the flour for baking cocoa. With that in mind, I’ve adjusted this recipe so that you only have to make one base batch of batter. 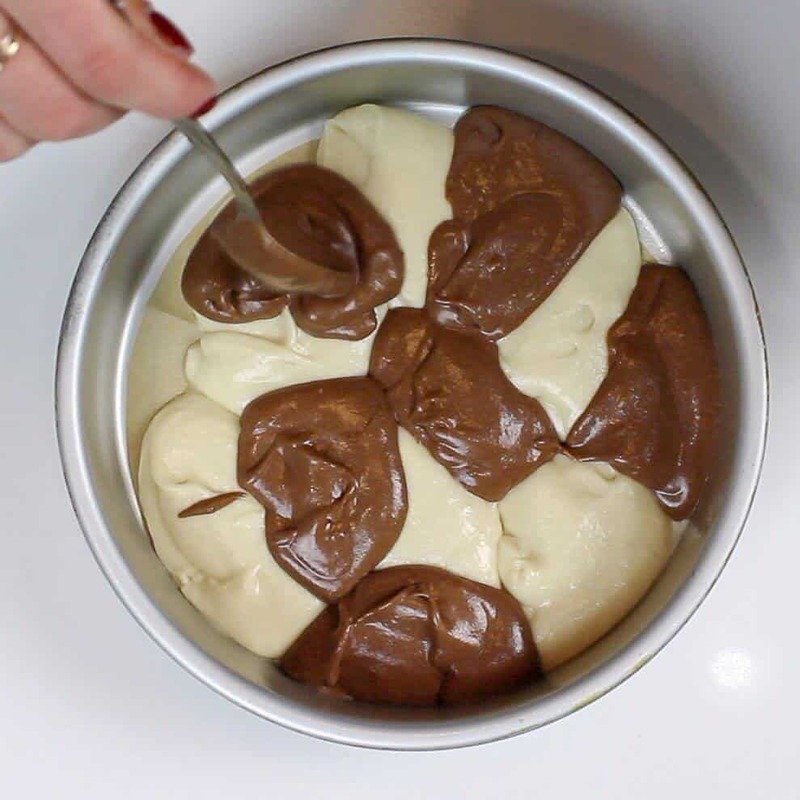 After making the vanilla cake batter, you can set aside half of it to make the chocolate batter. All you have to do mix in a few additional ingredients. Now you can forget about the extra dishes, and enjoy the cake once it’s made! If you want to up the ante, I also included a chocolaty fudge swirl! This is totally optional, but is such a pleasant surprise when you bite into this cake. It also bakes up beautifully, almost like it dissolves into the cake layers as they bake. The fudge ripple adds a rich and chocolatey flavor into each bite! I’m also big on aesthetics. The melted chocolate swirled into the batter looks BEAUTIFUL! Not only is it worth adding for the taste, it also creates a visually stunning look. Once both cake batters (and the optional chocolate fudge ripple) are made, the real fun starts. Alternate spoonfuls of vanilla and chocolate cake batter into your pans. Continue until you’ve evenly distributed the batter between the pans. TIP: It’s much easier to make sure your pans have the same amounts of cake batter if you add the spoonfuls of batter in rounds. Add a spoonful of vanilla to each pan, then a spoonful of chocolate to each pan, and repeat until you’ve used all your batter. Once you’ve used all your batter, use a spoon to add small drops of the chocolate fudge mixture on top of the cake batter. Be sure the chocolate drops are relatively spread out. This will prevent them from completely covering the cake batter when swirled. You want to be able to see each different component in these cake layers once they’re baked!! Then drag a small offset spatula or butter knife through the batter to create lines that are both horizontal and vertical. Make sure your offset spatula is lightly touching the bottom of the pan. 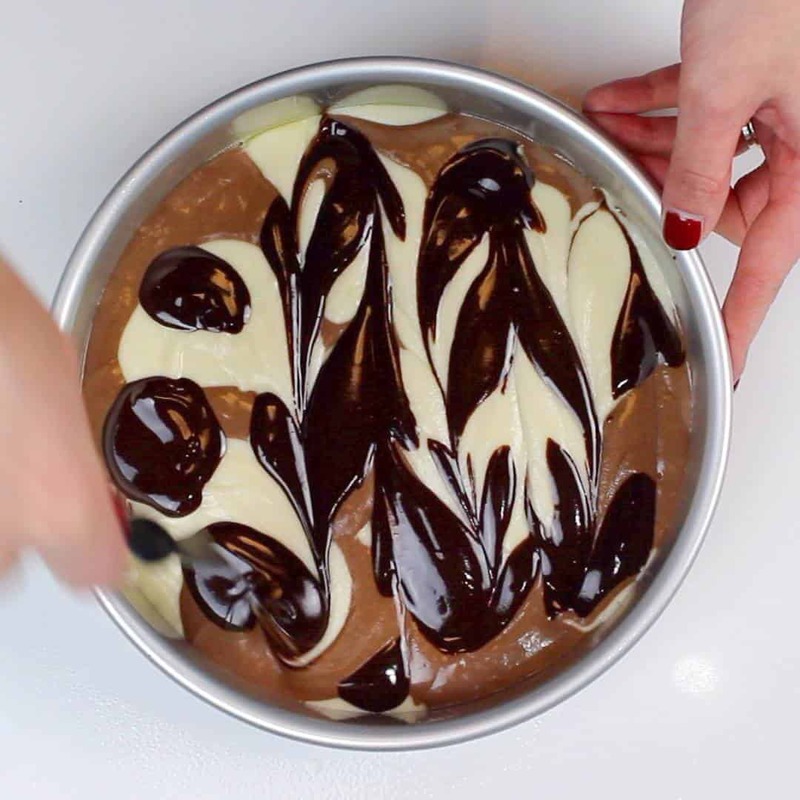 This helps make sure you’re swirling the batter throughout the layer, and not just on the top. Try to create the lines using one continuous motion, going up and down, and then side to side. Repeat with remaining cake layers. Then pop the layers into the preheated oven for 32-35 minutes, or until a toothpick comes out clean. 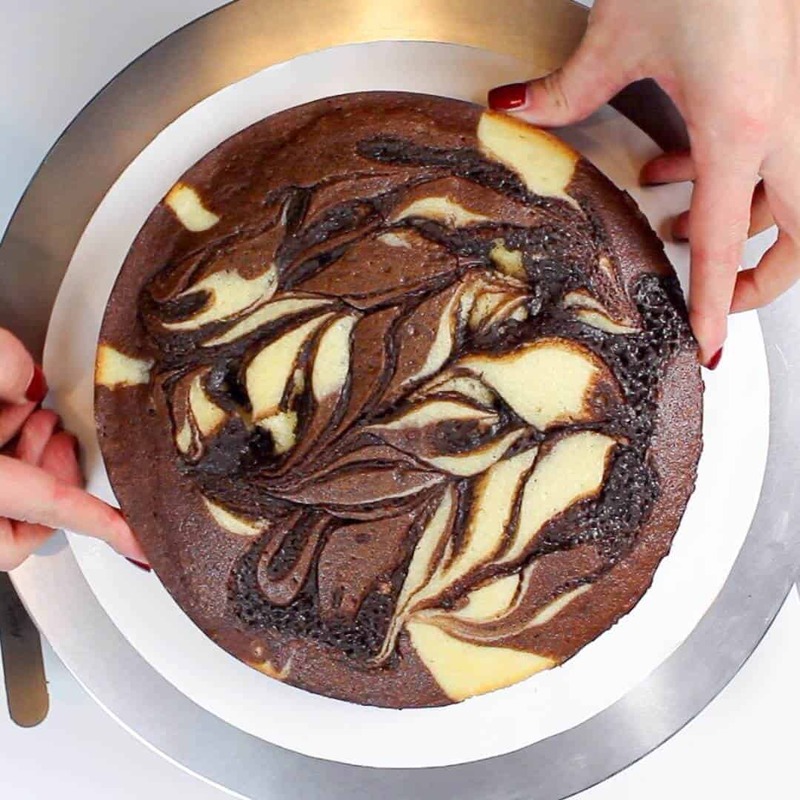 This marble cake recipe is honestly so delicious, it almost doesn’t need frosting. ALMOST. While I am guilty of eating cake tops plain while I level my cakes, this cake is taken to the next level with my fudgy chocolate buttercream recipe. My chocolate buttercream recipe uses both cocoa and melted dark chocolate, and boy is it tasty. 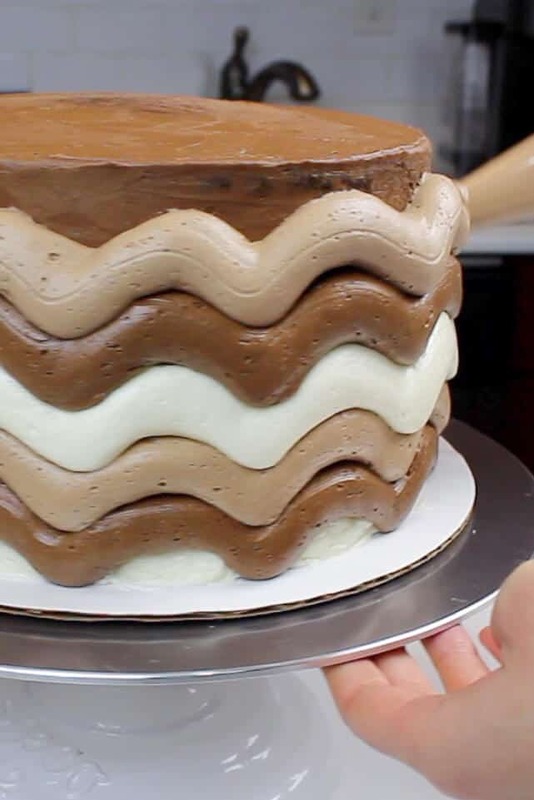 If you so chose, the last step is to cover these layers with your favorite buttercream frosting on them, and enjoy! While I chose to chocolate buttercream with my marble cake this time, I think cream cheese frosting would also taste great! I used three different types of buttercream to create a fun squiggly pattern. It was the only design that seemed to fit a marble cake in my mind. This is definitely a buttercream intensive design, but it is so fun to make. These layers bake relatively flat, but you can also trim and level them with a serrated knife if desired. 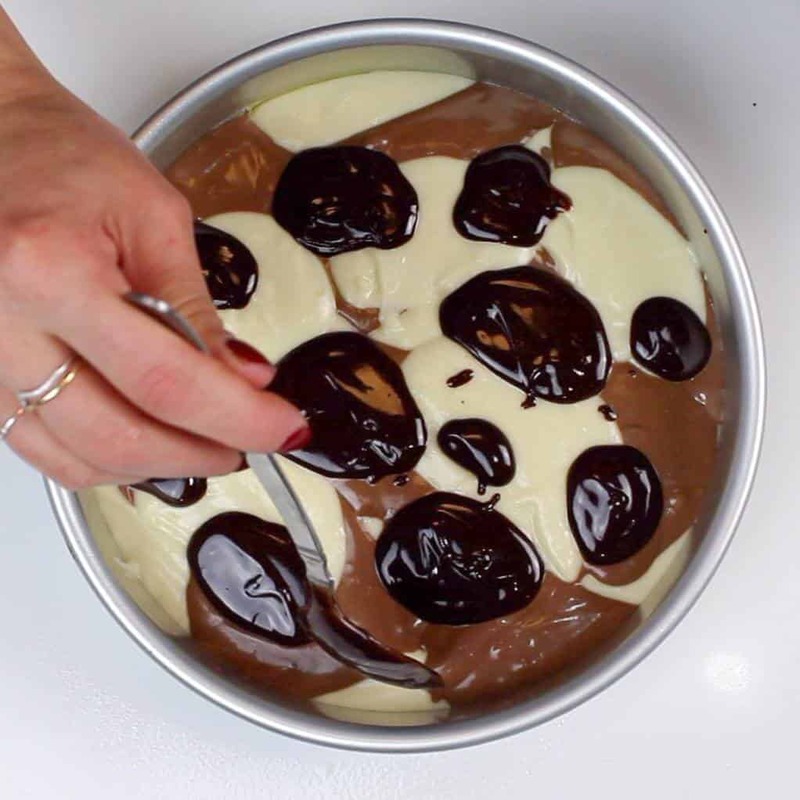 If you try this marble cake recipe, please tag me @chelsweets. Also use the #chelsweets, so I can see your beautiful creations!! This marble cake recipe uses one batter to make both the vanilla and chocolate batter, which are swirled with a fudge ripple! It is simply delicious!! Preheat oven to 350°F. Line four eight-inch pans pans with parchment rounds, and grease with non-stick cooking spray. Begin by making the vanilla cake batter. Mix together all dry ingredients (flour, baking powder, sugar, and salt) in a stand mixer with a paddle until fully combined. Pour half of the batter into a separate bowl (roughly 950 grams), and set aside. Next, convert the vanilla batter into chocolate cake batter. Mix the additional 1/3 cup baking cocoa, 1/4 sugar, 1/4 tsp salt, and 1/2 tsp baking soda into the remaining batter. Add the additional 1/4 cup egg whites, and 1/4 cup buttermilk, and mix on a low speed until smooth. 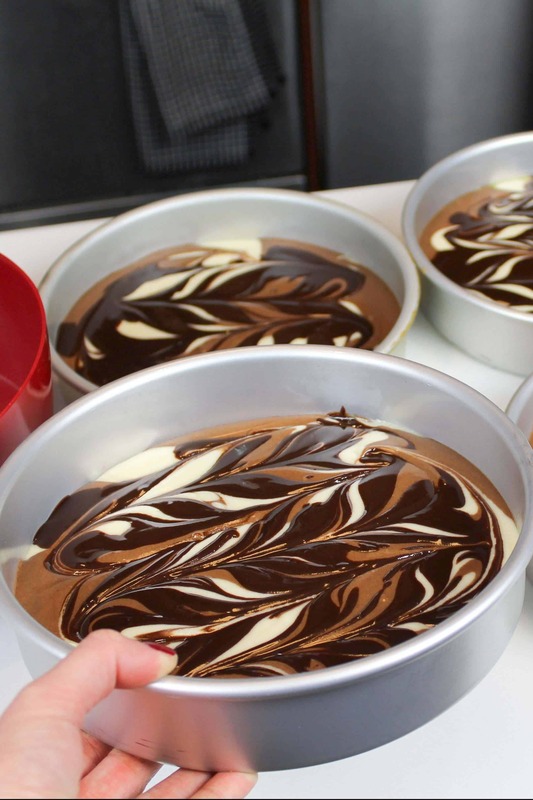 If desired, make the chocolate fudge swirl. Combine the chocolate chips, butter, and heavy cream into a heatproof bowl. Heat in two 30-second intervals, stirring in between. Allow the mixture to sit for 1 minute, then stir until smooth and set aside to cool. Alternate spoonfuls of chocolate and vanilla cake batter into the prepared cake pans, filling them roughly one inch high with batter (I like to use a digital kitchen scale to make sure each pan has the same amount of batter). 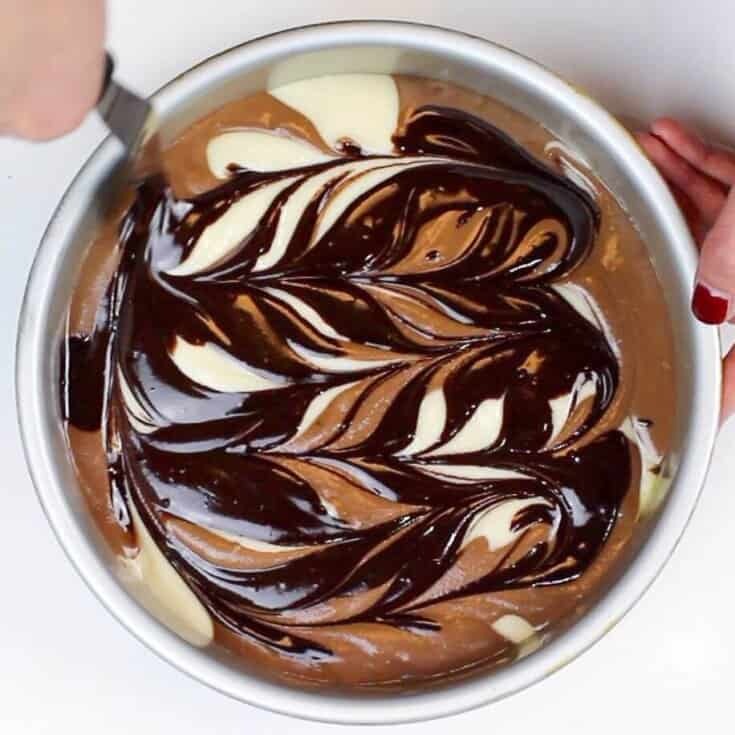 Add small drops (about one inch in diameter) of the chocolate swirl on top of the cake batter, then drag a small offset spatula or butter knife through the batter in horizontal and vertical lines to create a marbled patter. Bake for 32-35 minutes (or until a skewer comes out clean). Allow to cool for 10 minutes, then run an offset spatula around perimeter of the pan to separate the cake from the pan. If desired, level the cakes with a serrated knife once they're fully cooled. Place half of the buttercream into a seperate bowl. Mix in 1/2 cup of baking cocoa, and the melted chocolate chips. This will be used to fill the cake, and will be the darkest buttercream of the squiggles. Place in a large piping bag. With the remaining vanilla buttercream, place half of the into another large piping bag. Color the rest of the frosting with the other 1/2 cup of baking cocoa, to create a light brown colored frosting. Place in a large piping bag. Once all the different components of this cake are ready, begin to assemble the cake! Stack the cake layers on a grease proof, cardboard cake round. Spread a thin dab of buttercream on the center of the board, to help your cake layer stay in place. Next, center the first cake layer the cake board. Spread an even layer of the dark chocolate buttercream onto the cake layer. Repeat with remaining cake layers. Place the top cake layer upside down. Cover the cake in a thin layer of frosting, and smooth using a bench scraper. Chill the cake in the freezer for about 5 minutes, until the frosting is firm to the touch. Pipe squiggly lines of buttercream around the cake, alternating between the vanilla, chocolate, and dark chocolate buttercream. 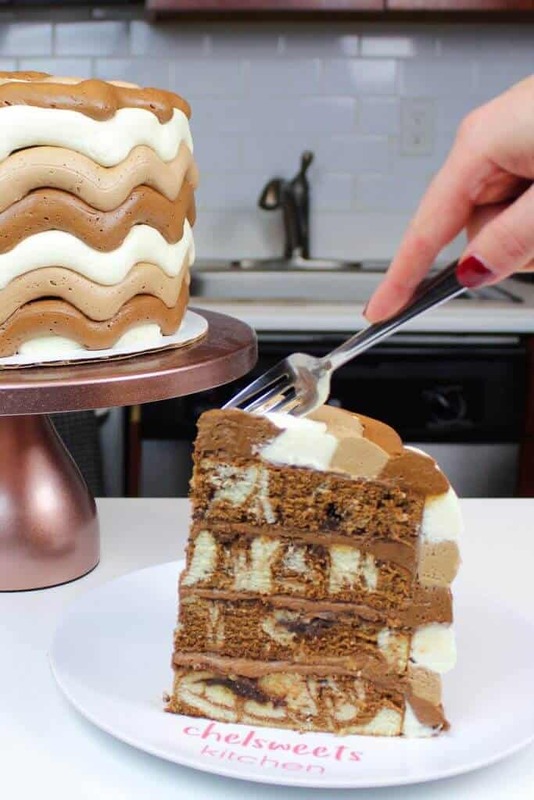 Thanks sharing the tweaked Marble Layer Cake and making it easier to recreate your marbleized design.You usually show how to assemble the layers and decorate it. I like how the finished cake look in the last photo and wonder if you have a video of how. Hi! If I half the recipe for 6 inch layers about how tall will they rise? This is going to be a perfect recipe for you then!! I loved the chocolate swirl, but I’m also a huge chocolate fan! You can definitely skip the chocolate fudge swirl if you think it’ll be too much for your taste ?? Hi Chels! I need to make Character cake and I know I’m going to need to use a 9×13 pan but I dont want super thin layers because I’m going to need to carve. Should I double this recipe and do it in one 9×13 pan or double it and bake in two 9×13 pans and then sandwich then together? I usually use one batch to make two 9×13 inch cake layers, and sandwich them together! Each layer ends up being about 1 inch tall. If you want them thicker than that you can definitely make 1.5 or 2 batches! Just be sure to use flower nail (placed upside-down in the center of the pan) to help them bake evenly! Yup, that’s actually what I use!! Can I use semi sweet chocolate bars instead of mini chips? You definitely can Rosemary!! That would work too! Hello ? I would love to try this recipe for my daughters birthday. I would be doing a 4 layer cake using 8″ round pans. If I doubled the recipe would this be adequate? Thank you!